Simpsons Case: Loft Trimmed or Tiered? This lovely brush came with very little in the way of a decal and looked terrible, so I cleaned the remnants off. There was literally just a ring of adhesive left. It wasn't a Simpson decal, either, but it is surely a Simpsons Case. I bought it from a chap in the USA. You might be able to see the lighter area where the decal once was. My question is: do I leave it as is, or apply a new Simpson decal? I am inclined to leave it like it is. It's beautiful and a more shapely handle than my current Case. But I'll take suggestions. Now, this is where it gets interesting. Before I cleaned it up (borax soak, then white vinegar, etc, then shampoo) I thought I had bought a dud. Why? Well, the loft appeared to be trimmed in circles going up the loft in three clear sections. But I looked closer, and noticed there were no harsh, straight lines like scissors may have made. You can hardly notice now with the bloom. I can only conclude that the hair was packed in the handle in a 'tiered' method, to get the right shape. I am convinced the hairs are NOT trimmed. You can also see the handle says "Best" but it looks like Pure. Or half-half. It certainly feels soft, anyway. Has anyone come across this 'tiered packing' technique, as I will call it? When the loft is soaking wet, the 'lines' are clear. Comments would be very welcome. Enjoy the photos. As for the knot itself, I'm no expert, but the canons used to form knots are usually curved as opposed to tiered to provide a smoother more uniform shape. If it hasn't been trimmed (which would have been my guess), perhaps there has been some hair loss or breaking, although you wouldn't expect it to be as uniform as you have described. Shaun, is the knot wet or dry bloom in pics? I had a duke 2 with very similar conditions and actually very similar banding colors. Ultimately I ended up reknotting as the old hairs started sheering off at the base of the knot. As for the sticker, I could go either way... They come off easy enough if you really want them to. In the pics, the loft is damp. I took out my loupe and examined the hair tips at the 'edges', and there is a mixture of trimmed hair and longer, tapered hair there, which suggests to me that this was not an owner having trimmed the hairs with scissors. With the bloom, as mentioned, it evens out; nothing jagged or ragged. 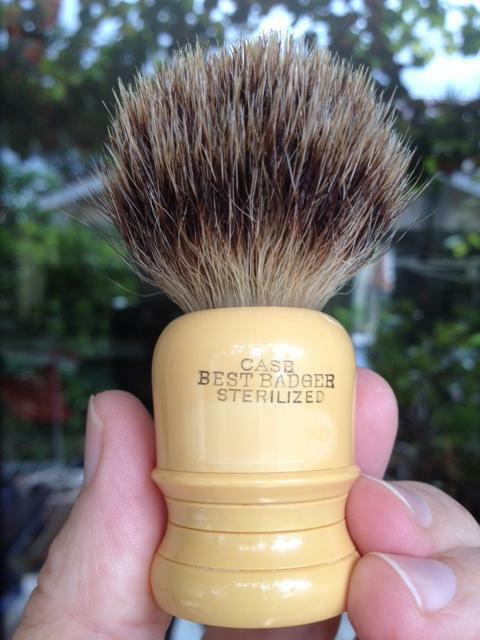 The hairs at the tip of the brush are the same, too. I am convinced, seeing the longer tapered hairs at these sections, if I could call them that, that this was how the loft was put together. Having said all this, the decal was not a Simpsons, and so perhaps the loft was attached in the states, the handle turned in England?? 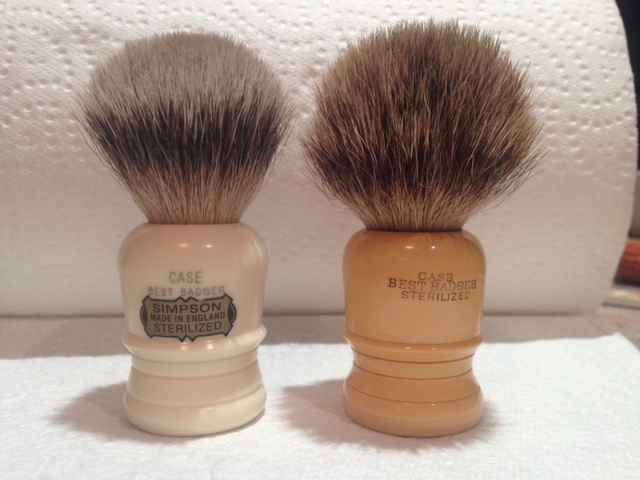 You often see vintage Case brushes made for the US market with different brands. Just my guess. Age wise, I couldn't say. 1965?? A bit earlier?Any guesses, friends? 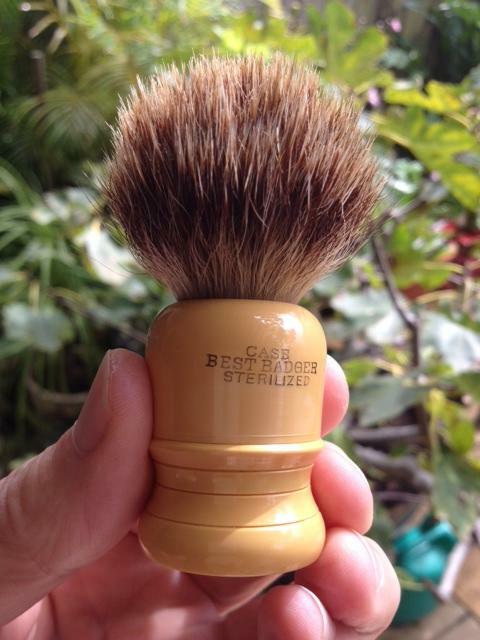 Shaun, that is a fine looking brush! I hope you enjoy it. Two more pics: the current Case and the vintage version. The modern version (this particular one) weighs 42g; the vintage comes in at 44. 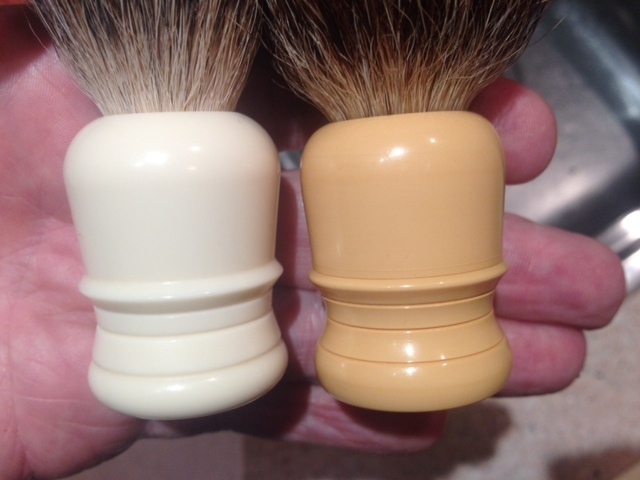 The vintage handle is slightly shorter, slightly finer shape, and you can see the difference in loft. The modern loft is the denser of the two. The vintage hair feels a little coarser but is still plenty soft. Compare the lathing work on the two. The vintage is finer, clearly, and IMO, better. True craftsmanship. My vintage X1L and "60" also have a knot with that shape, so I'm inclined to think that it was indeed shaped that way. I would not put a new sticker on it either. 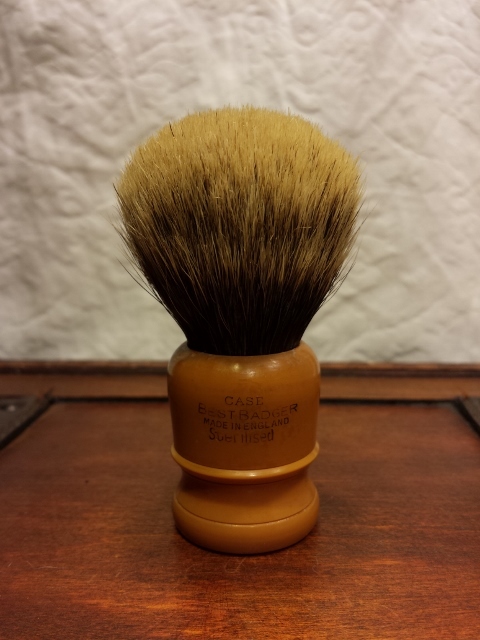 Beautiful example of a Vintage Butterscotch CASE, enjoy!!! i would leave as is. beautiful handle color and more elegant lathe shapes than the newer. It's a beaut how it is - I would vote no sticker. I have a vintage Case as well. The knot is shaped the same as yours. I've come across 3-4 other vintage Simpsons, and they all have this loft style. I always assumed it was age-related. The tips are super soft. That's a beautiful brush you've got there mate - it would be a travesty to put a modern sticker on it in my view. We should start a vintage Case club! As you can see, it was common for Simpson to set the outer ring of hair a bit lower than the rest of the knot. I'm not sure if they did this for aesthetic or perceived performance purposes, but my Polo, Duke and other butterscotch Simpsons all share this trait. (04-07-2014, 12:00 PM)blzrfn Wrote: We should start a vintage Case club! Dave, that's a superb brush. Beautiful loft. I have been doing some researches and yes, I can see that there is certainly a technique that was used to give the loft the desired shape by setting the outer hairs lower into the handle (or trimming them at the bottom and then setting them). I have seen that on a few different Simpson lofts now that I am looking. It's good to see other vintage Cases. I am not going with the new decal. Overwhelming 'no' from contributors. In any case (bad pun) I'd feel like I was cheating. It's lovely the way it is. It's stunning as is. No new sticker. If you disobey you will be punished. (04-07-2014, 04:52 PM)scritchnscrub Wrote: It's stunning as is. No new sticker. If you disobey you will be punished.